Are You Asking Your Glass Manufacturer the Right Questions? After being in the glass manufacturing business for 80 years, Swift Glass has seen its fair share of customer questions. 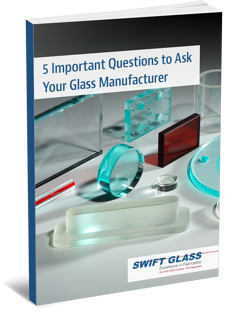 To help ease the glass selection process, we’ve compiled the most commonly asked questions — with answers — that we’ve received over these years into an all-inclusive eBook, 5 Important Questions to Ask Your Glass Manufacturer. Asking your glass manufacturer these questions will help streamline your project’s turnaround time and ensure you select the right material for your application. How can we reduce our project’s cost? Find the answers to these questions by filling out the form to the right and downloading this free guide.